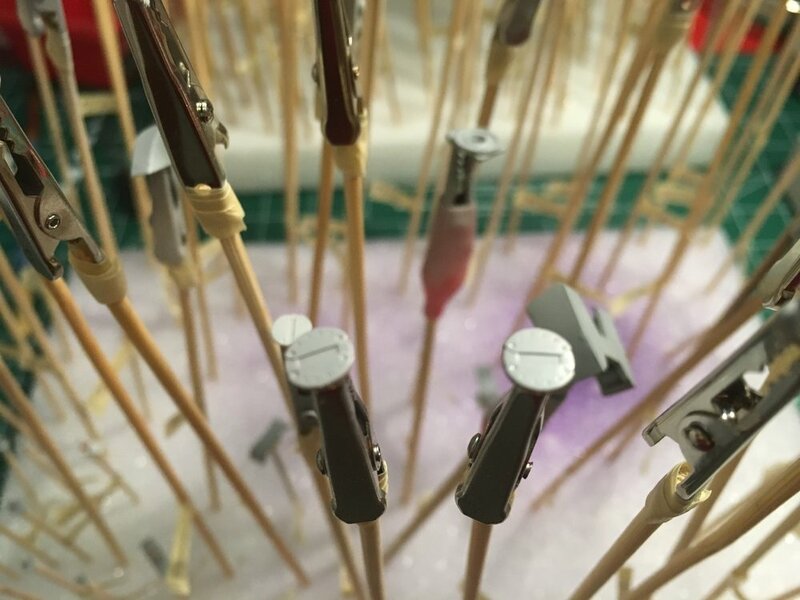 Prime and paint time for the RG Zaku II! There are SO many parts! I decided to paint every part, whether it would be visible nor not. In doing so I've learned it's easier to hand paint small parts with little surface area, where larger parts are a challenge to paint without visible brush strokes. So far I've found that keeping a lot of paint in the brush and trying to lay down one continuous smooth brush stroke is the best. That means making sure the paint is thinned just right and dabbing the brush just a tap after dipping it in the paint. For thinning, they say you want it the consistency of 2% milk and I find that's pretty much accurate. Usually when you paint with a brush you dip it in the paint/thinner mix and dab it on the side to get excess paint out before you apply it. When painting a larger surface area I do that less so there's more paint in the brush and it goes on heavy enough to hide the brush strokes. I'm still learning and not perfect yet, but it's coming along! I find that when you leave a lot of paint in the brush, it looks like too much is on the part after you apply it but that's actually what you want because as it dries it levels out. I think it's the thinner that does this, so the better thinner you have the more it will level out as it dries. So far I have my highlight colors done: copper, black and pink (maybe another coat of pink). Now I have metallic black, metallic silver, light grey and grey. Grey will have the most parts so hopefully I'll get it all done in 1 session so it's consistent. I'm still having fun and learning! Enjoy the pics! 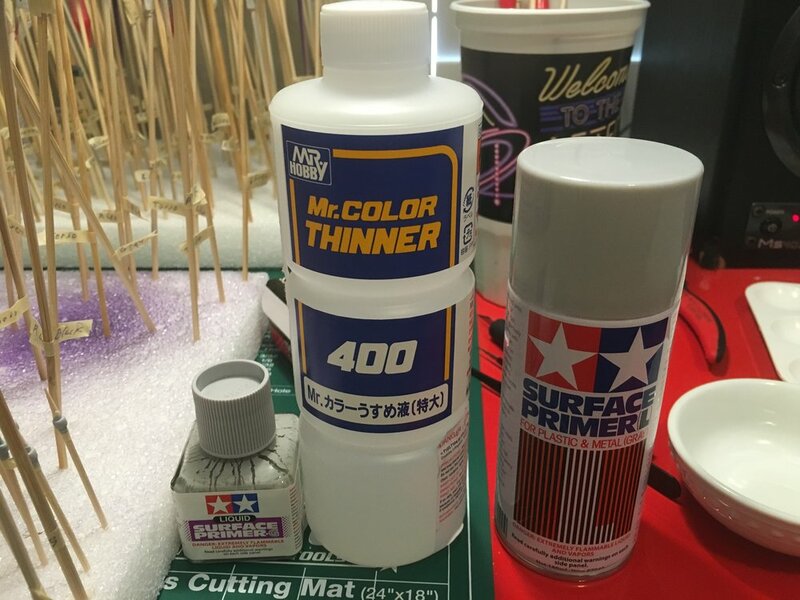 I used 1 & 1/2 cans of Tamiya spray primer and some Tamiya surface primer thinned with Mr Color lacquer thinner. The surface primer looked too thick at first but it leveled out quite a bit. All parts on clips and primed (except the weapons; after running out of clips a second time I didn't want to make more). I think it's about 130 pieces. Tiny pieces! A pain to remove nubs but easy to prime and paint. I hand brushed primer on these and the little details looked filled, but as the primer dried it evened out and they came back through. Copper, black and pink. Pink may need another coat; the grey primer is still a bit visible on the edges. Maybe I should have primed white instead.